This is the July picture, it's also the color splash page to manga volume 8.
keep those pretty scans coming!! Another beautiful Yuuko picture. 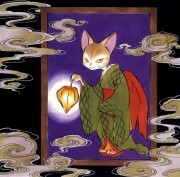 Just when you think clamp has outdone themselves, something like this comes out :) . it looks really cool!!!! i love it! Great scan ! Good job :D .
My fav Yuuko-san's pic! I lover as the Lady of the lake... such pretty lotus princess! 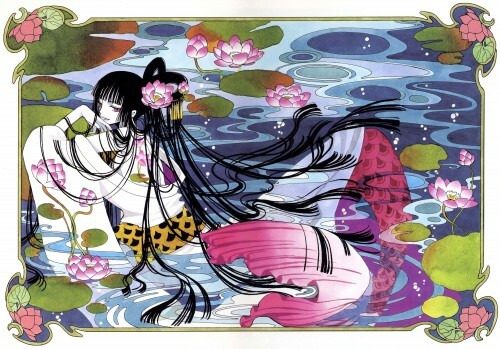 My fav detail of the image is her mermaid tail coming out the kimono! So nice! CLAMP rockz! Thanks for posting this text-free version! Right to my favs! Beautifull! this picture she ahd a lot of beautiful of that normaly she have! Isnt that Yuko from Tsubasa/XXXholic? I love her~! She really look beautifull in her pose! She is so pretty. I love the scan. Such a pretty thing she is. Do scan and share more. yuuko always looks so fashionable~! The use of colors in this one is really superb. Thanks! Beautiful =) Thanks so much for sharing!